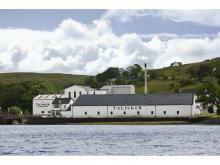 The latest release from Talisker distillery, Storm turns up the peat smoke and adds a touch more sherry to the mix. The new release is bottled at the same strength as the standard Talisker Ten Year Old – 45.8% – but is made up of a range of ages, including some younger whiskies. These younger elements add a fiery note, making Storm a hearty, and very aptly named, dram. Peat smoke is immediately evident when you pour a dram, but the sweet sherry notes round off the edges. It's bracing and salty, like a coastal walk on a wild day, but the sweetness keeps you well wrapped up and toasty. The familiar Talisker peppery note comes in strongly at the finish, bracing and warming, to remind you that this is the pefect whisky to have in your hip flask on a winter's day. 45.8% / 70cl, £40, Royal Mile Whiskies and other specialist retailers.